Relay failure melted down the terminals on this compressor. Many times, the terminals will become brittle and break off. Reconnecting the new relay becomes an artistic challenge at this point. Sometimes, there’s no choice but to replace the compressor for big bucks. This is always true if one of the compressor connection studs breaks off. 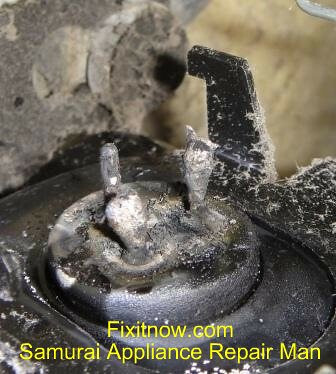 This entry was posted in Refrigerator Repair on September 11, 2010 by Samurai Appliance Repair Man.